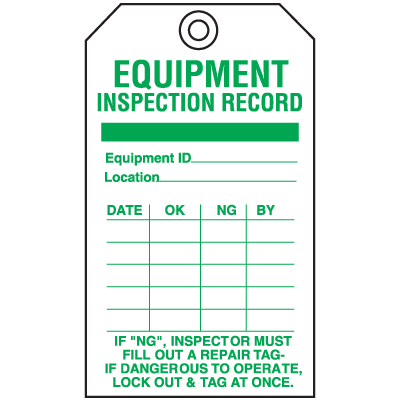 EQUIPMENT INSPECTION RECORD EQUIPMENT ID._____ LOCATION.______ DATE._____ OK.____ NG.____ BY._____ If "NG", IF "NG", INSPECTOR MUST FILL OUT A REPAIR TAG. IF DANGEROUS TO OPERATE. LOCK OUT & TAG AT ONCE.